This service is for serious rankers. Nick from RankersParadise.com ranked his page number 1 on Google search using this exact strategy, he was page 1 for his selected keyword on day 1 and hit the top spot a short time after that. This strategy works, it is proven and will get you a top rank. If you want to hit the Google no. 1 position for your selected keyword and stay there you need quality. This service is top quality. These are premium Web 2.0 backlinks done the right way. First of all we write 5 artciles. That's correct, you get 5 hand written completely unique articles. All articles are hand typed, there will be no spun content at all on Tier 1. You get the full use of my VA's here. I have tried and tested them and they work really well. My content writers are top class. When your order is started my team will start with your content right away. Unique hand written content is the key to long term ranking success. Use quality hand written content on tier 1. We write the content for you, it is all included in the price. When the 5 pieces of top quality content are complete we drop them onto 5 high domain authority Web 2.0 sites. We will use your keyword in the sub domain URL of the web 2.0 site. This will give you a quality contextual backlink from a high authority site. If you do not want to use this anchor text distribution just let us know what you want us to use and we will do that for you. Each Web 2.0 site will include 2 or 3 images in the post and also a related video taken from YouTube. The sites will include your keyword in the post title, in the post url and also mentioned within the content at the top, middle and bottom. The Web 2.0 sites are useless without backlinks pointing to them too. So we are going to link the 5 new Web 2.0 sites up into a link wheel. That's Tier 1 taken care of. Now we are going to power up those high quality Web 2.0 backlinks. This is where the real value lies with this service. Each and every Web 2.0 site (post page) is going to get 10 backlinks from high page authority Web 2.0 sites. 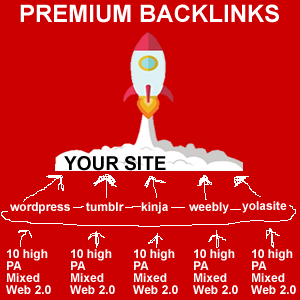 Each and every site will get 10 backlinks from different web 2.0 Tumblr sites that have lots of backlinks pointing to them. Tier 2 backlinks will come from high PA Tumblrs, all that lovely rank juice will flow around your Tier 1 Web 2 sites, which in turn will pass to your money site and rank you up big style. These blogs all have backlinks pointing to them and are all indexed. The homepage of each blog is already indexed in Google search and we are going to utilise this. You are never ever going to have to index any of the new Tier 1 web 2.0 backlinks. The Tier 2 backlinks will ensure those backlinks get found by Google bot. The beauty of using already indexed Web 2.0 sites to index your new sites is that you do not leave any footprints at all. The content used on the 50 Tier 2 backlinks will be readable and spun. This does not matter on Tier 2, we are only using these sites to index our Tier 1 backlinks and to add some authority to them. You are getting a lot of work done here for your money. These 5 high quality backlinks will be enough to rank easy low competition keywords. In total you are getting 55 high quality backlinks used the right way. Do not build any more backlinks, these alone will get your site ranking up. If you do this over 3 months you are certainly going to rank number one on Google search for the right keywords. This is the right way to build backlinks for long term ranking results. If you are struggling to rank you really do have to try this, you are going to be amazed at the results. 50 tier 2 high PA web 2.0 backlinks (you do not get the login details for these sites) Sites will have PA 28+ and lots of backlinks pointing to them, which of course stand as your Tier 3 backlinks. All of the lovely link juice flows down to your money site. Your new Web 2.0 sites will rank in the SERPs for your selected keyword. As the new high quality Web 2.0 sites rank up your money site will BLAST TO THE TOP. Top ranking sites have more linking domains. Lots if links from different sites that are relevant will rank you high. Blasting your Tier 1 links with mixed Tumblr Web 2.0 sites for Tier 2 backlinks and it will help them index and also rank them high in Google search. You can crack on adding quality content to your money site while we take care of the backlinks. No need to worry about ranking anymore. Add the content to your site, order this service and move onto your next piece. This way your money sites constantly gets content added to it and at the same time is getting quality backlinks too. PLEASE READ: When the work is delivered there are no re-funds for obvious reasons. When the order has been placed it can't be canceled because the work will have been started. Also, we do not guarantee any rank improvement, we can't control what your competitors are doing. However, this will add authority to your site and these Tier 1 Web 2s will be an asset to your business, you will have the login details and can use them to rank other pages on your money site. All content will be in ENGLISH, if you want anything other than this please message me before you order. Premium Quality Web 2.0 Backlinks RANK BLAST to hit Google TOP SPOT is ranked 5 out of 5. Based on 27 user reviews.